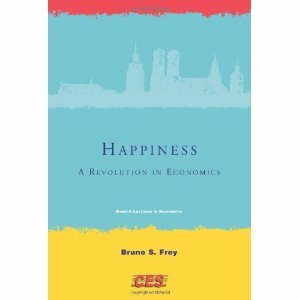 Bruno Frey is a professor of Economics at the University of Zurich, and this book, subtitled "A revolution in economics", compiles the results of several papers he (co-)authored. In a nutshell, he argues that conventional economic theory assumes people always make rational choices in order to maximize their utility, while happiness research claims that people's choices are significantly less rational, and utility doesn't correspond to well-being. In traditional economics, utility is typically modelled as income, as it comes in numbers and is thus convenient to use. But maximizing utility does not maximize happiness, because people quickly adapt to an increased level of income, and it only makes them happier up to a certain point. Beyond that, money will likely be more of a burden. Relative income is much more important, for example people are happy with a raise until they realize their collegues are earning more. Still, people assume a higher income will make them happier than it actually will, for example, people are willing to commute significantly longer in a job that pays more. However, the cost for commuting ultimately exceeds the benefits of a higher salary. Frey describes such behaviour as mispredicting utility. People seem to overestimate the impact of goods or actions with extrinsic attributes, such as possessions, fame or more bluntly, watching TV, while underestimating those with intrinsic attributes, like skills, relatedness or autonomy. People also quickly adapt to the former, like getting used to a flatscreen TV, while having a conversation with a friend is something we truly enjoy over and over again. As the traditional interpretation seems to be inadequate, Frey suggests to replace utility with experienced utility. A major drawback of experienced utility is that it's hard to measure. The most common instruments are surveys, where people report their subjective well-being in questionnaires. As this is a quite simple way to gather data, there is lots of it around. Unfortunately, you can hardly compare the results of people's reports, as person A's happy might be person B's normal. Furthermore, an unsolved issue is causality. Are high incomes making people happy, or are happy people simply making more money? This may sound like a trivial objection, however simple correlation is not enough to proof what is cause and what effect. Frey also mentions procedural utility, another aspect of experienced utility. Here, the outcome is not the sole factor for utility, the process is also considered. For example, employees who are granted participation rights and are working in processes experienced as fair, report significantly higher happiness than people under worse conditions, even if they earn the same wages. I can relate to the approach of procedural utility, as I experience happiness not as much as a goal, but more like the side effect of a good life. It sparks up here and there quite unpredictably. This is also what the paradox of hedonism teaches us, pleasure cannot be acquired directly, it can only be acquired indirectly. Despite having studied some economics I can hardly judge how revolutionary these findings really are. Still, to me, they are, especially the notion that I'm most likely unable to predict what makes me happy is somehow liberating. It takes the sting out of any goals. I'm not meaning to abandon them all, but reaching them should be in balance with enjoying the way there, taking a look what's around, and being more playful and open.